A vegetarian diet can greatly benefit seniors because it’s naturally rich in essential minerals and vitamins that will leave them looking and feeling wonderful. For seniors who need new ideas for veggie meals, Rhode Island home care providers can recommend four vegetarian dishes that won’t disappoint. A vegetarian burrito is easy for seniors to make and it’s very nutritious. They can make it with refried beans, chopped lettuce, vegan sour cream, grilled vegetables and chopped tomatoes. A senior could also make their burritos with kale instead of lettuce. Refried beans are a staple in most Mexican foods and are high in vitamins B-6, K, and C. Vitamin C helps heal wounds and prolongs the health of cells, tissues, and organs. Surprise the senior you’re caring for with a high-protein dinner like grilled polenta topped with mushrooms. Chopped tomatoes could also be mixed in with the mushrooms. This all-around healthy vegetarian dish is rich in vitamin A and fiber. Mushrooms are rich in vitamin B-12, which helps regulate the nervous system and reduces stress and brain shrinkage. A delicious carrot soup is a delectable dish that would be fun for a senior and their caregiver to make together. Instead of soup, seniors could also make a yummy carrot puree with croutons. Carrots are highly rich in vitamin E, which supports healthy eyesight. This veggie is also rich in vitamins K, C, E, and B-6. 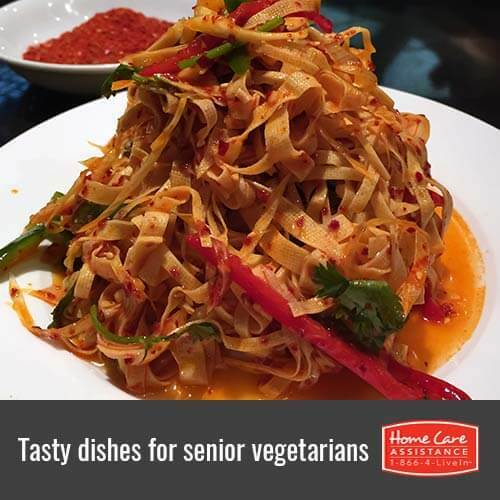 Seniors can get creative and make a tofu stir-fry with their favorite veggies. Tofu is rich in riboflavin and niacin. It’s also a good source of protein. Vitamin-rich vegetable options for this stir-fry include cabbage, carrots, bell peppers, onions and squash. Onions contain a compound called quercetin, which plays a crucial role in preventing heart disease and cancer. Sometimes seniors need a little help in the kitchen from knowledgeable caregivers. Home Care Assistance is a leading provider of home care Rhode Island families can trust to prepare nutritious meals for their loved ones. We provide comprehensive services such as Alzheimer’s, dementia, stroke, and Parkinson’s home care in Rhode Island to help seniors make the most of their golden years. Contact us today at (401) 284-0979 to schedule a free consultation and learn more about how we can help your senior loved one.